It's been a while since I've really had an interest in the bulk of a nail polish collection, but the cream half of the China Glaze Sunsational Collection really seemed too good to pass up. The collection consists of six cream shades and six jellies. What drew me to these is the fact that they pack a neon-esque punch without being so blindingly bright, and without needing a white polish underneath. Oh, and they're creams, I love a good cream finish. Unfortunately, the formula here isn't so hot, save for Too Yacht to Handle, it fared a bit better. The polish is really thin, and prone to streaking. It does build up decently after a few coats, but it's defiantly not what I would have expected from China Glaze. Sun of a Peach is a really vivid peach cream. LOVE this shade! It's pretty bright, almost neon, and just so perfect! It's the brighter, amped up sister of China Glaze Peachy Keen. This is four coats. This shade has the worst formula of the three I have. I found it was best not to do really thin coats, as it tended to streak and drag more. Luckily, it's still possible to get a nice finish regardless of the terrible formula. This shade is a must have! Highlight of my Summer is a vivid mint green cream. I hate to be so repetitive, but LOVE this one too. If you love mint green- honestly, who doesn't? This is a must have. It's not neon, but it's bold and bright. This is two thick coats. Too Yacht to Handle is a bright teal-blue shade. 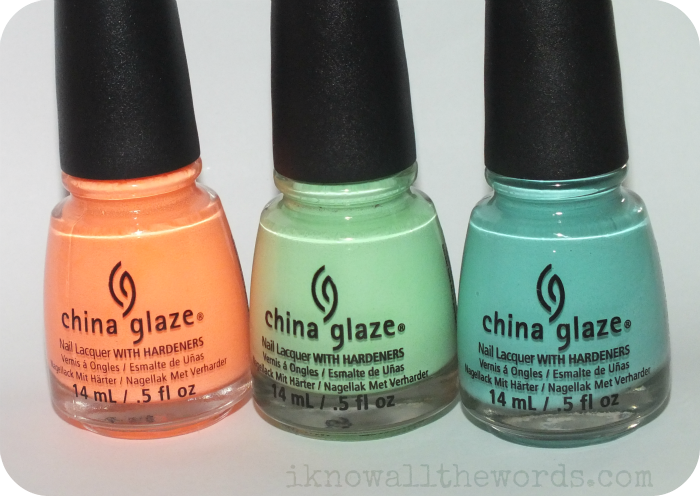 Think a bright version of China Glaze For Audrey. I had a bit of buyers remorse with this one- it seems like we've seen it before, no? It is brighter than most of the other polishes in this colour family, but if like me, you feel like a you already have too many teals, skip it. Overall, two must haves in the form of Sun of a Peach and Highlight of my Summer. Are you interested in this collection? Which shades?